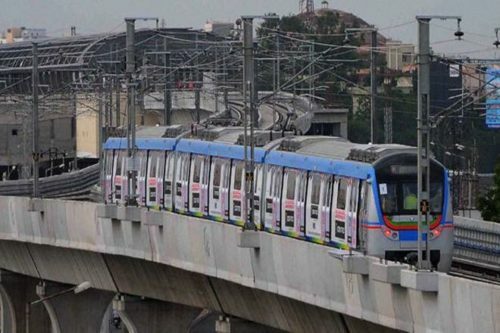 Hyderabad: The L&T Metro Rail (Hyderabad) Limited, the concessionaire executing ₹ 16,375-crore Hyderabad metro rail project under the PPP (public, private partnership) mode, has reiterated its commitment to complete the project as per schedule. “City obstructions that crop up are being tracked and addressed at regular intervals at the highest level, to make sure that the momentum is not lost and the project is completed,” he said. Providing a mid course project update, he said two stretches of metro project have secured safety certificates. Of the 72 km metro project, thus far duct foundations for 59.05 km, Piers in 56.61 Km, Span Erection in 47.66 km and track work on 35.70 km has been completed. And works on 17 stations has been completed in Stage 1 and work at 3 Interchange Stations and other 30 Stations are in progress. Thus far all the 57 trains (rolling stocks) have arrived at the depots. While one of the rail over bridges has been completed, work on the remaining 7 ROBs is in progress. Overall 67 per cent of the total work has been completed as of September 30, 2016, which by all standards is a speedy execution, he said. “Working in crowded and difficult stretches like Sultan Bazaar area is on brisk pace in spite of rains and festive season. We reiterate our commitment to complete this prestigious project expeditiously with all the support and cooperation of Telangana Government,” he said.